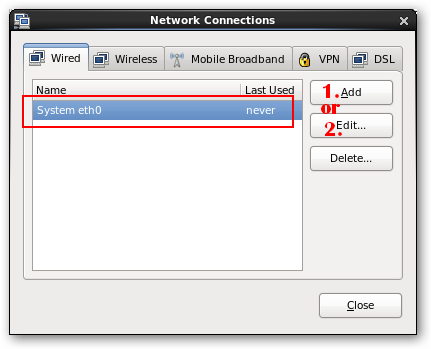 從 RHEL 6 開始,透過網卡設定工具程式 “NetworkManager Applet” – http://www.gnome.org/projects/NetworkManager/ 就可以很簡單的將網卡設定成 IP V6 的格式. 在工具列可以找到他 ,或是在 System / Preferences / Network Connection 這裡也可以設定.NetworkManager Applet 支援的網路介面很多包含了有線網路(Wired), 無線網路(Wireless), 行動寬頻(Mobile Broadband), VPN, ADSL等設定,除了 IPv4 外還支援了IPv6 及藍芽. 用來設定無線的網卡 Wi-Fi ,IEEE 802.11 為標準的無線區域網絡. VPN (Virtual Private Network) ,VPN 主要是在既有的網路連結上加密就如同形成一個安全通道. Digital Subscriber Line 就是一般家裡使用的 ADSL 上網. 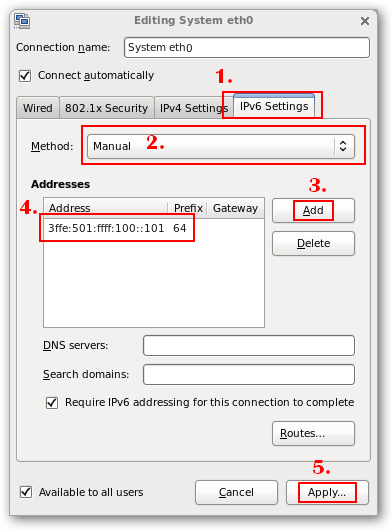 NetworkManager 使用 router advertisement (RA) 來獲取 IPv6 位址,這個方式必須搭配 Router 來指派,或是 raddvd 來使用. 一樣 NetworkManager 使用 RA 來得到 automatic, stateless configuration, 但 DNS servers 以及 search domains 是會被忽略的不被指派的. NetworkManager 不使用 RA 的方式,須透過 DHCPv6 來得到 IPv6 位址. 如果要 ping IP V6 的 IP 須使用工具 #ping6 ,#ping 指令只適用於 IP V4 時候使用.